Helen Johnson, a spacecraft technician at NASA's Goddard Space Flight Center, works on one of the three tiny Space Technology 5 spacecraft in preparation for its technology validation mission. For spacecraft, power is everything. Without electrical power, satellites and robotic probes might as well be chunks of cold rock tumbling through space. Hundreds to millions of miles from the nearest power outlet, these spacecraft must somehow eke enough power from ambient sunlight to stay alive. That's no problem for large satellites that can carry immense solar panels and heavy batteries. But in recent years, NASA has been developing technologies for much smaller microsatellites, which are lighter and far less expensive to launch. Often less than 10 feet across, these small spacecraft have little room to spare for solar panels or batteries, yet must still somehow power their onboard computers, scientific instruments, and navigation and communication systems. Space Technology 5 was a mission that proved, among other technologies, new concepts of power generation and storage for spacecraft. “We tested high efficiency solar cells on ST-5 that produce almost 60 percent more power than typical solar cells. We also tested batteries that hold three times the energy of standard spacecraft batteries of the same size,” says Christopher Stevens, manager of NASA's New Millennium Program. This program flight tests cutting-edge spacecraft technologies so that they can be used safely on mission-critical satellites and probes. “This more efficient power supply allows you to build a science-grade spacecraft on a miniature scale,” Stevens says. Solar cells typically used on satellites can convert only about 18 percent of the available energy in sunlight into electrical current. ST-5 tested experimental cells that capture up to 29 percent of this solar energy. These new solar cells, developed in collaboration with the Air Force Research Laboratory in Ohio, performed flawlessly on ST-5, and they've already been swooped up and used on NASA's svelte MESSENGER probe, which will make a flyby of Mercury later this year. Like modern laptop batteries, the high-capacity batteries on ST-5 use lithium-ion technology. As a string of exploding laptop batteries in recent years shows, fire safety can be an issue with this battery type. Now that ST-5 has demonstrated the safety of this battery design, it is flying on NASA's THEMIS mission (for Time History of Events and Macroscale Interactions during Substorms) and is slated to fly aboard the Lunar Reconnaissance Orbiter and the Solar Dynamics Observatory, both of which are scheduled to launch later this year. Thanks to ST-5, a little sunlight can go a really long way. Find out about other advanced technologies validated in space and now being used on new missions of exploration at nmp.nasa.gov/TECHNOLOGY/scorecard. Kids can calculate out how old they would be before having to replace lithium-ion batteries in a handheld game at spaceplace.nasa.gov/en/kids/st5_bats.shtml. The new NOAA-19 is the last and most capable in the long line of Television Infrared Observation Satellites (TIROS). Spotting volcanic eruptions, monitoring the health of crops, pinpointing distress signals for search and rescue teams. It's not what you might expect from a weather satellite. But these are just a few of the abilities of NOAA's newest polar-orbiting weather satellite, launched by NASA on February 6 and turned over to NOAA for full-time operations on February 26. Formerly called NOAA-N Prime and now renamed NOAA-19, it is the last in its line of weather satellites that stretches back almost 50 years to the dawn of the Space Age. Over the decades, the abilities of these Television Infrared Observation Satellites (TIROS) have gradually improved and expanded, starting from the grainy, black-and-white images of Earth's cloud cover taken by TIROS-1 and culminating in NOAA-19's amazing array of capabilities. “This TIROS series has become quite the Swiss army knife of weather satellites, and NOAA-19 is the most capable one yet,” says Tom Wrublewski, NOAA-19 Satellite Acquisition Manager at NASA's Goddard Space Flight Center in Greenbelt, Maryland. The evolution of TIROS began in 1998 with NOAA-K. The satellites have carried microwave sensors that can measure temperature variations as small as 1 degree Celsius between Earth's surface and an altitude of 40 kilometers—even through clouds. Other missions have added the ability to track large icebergs for cargo ships, monitor sea surface temperatures to aid climate change research, measure the amount of ozone in Earth's protective ozone layer, and even detect hazardous particles from solar flares that can affect communications and endanger satellites, astronauts in orbit, and city power grids. NOAA-19 marks the end of the TIROS line, and for the next four years it will bridge the gap to a new series of satellites called the National Polar-orbiting Operational Environmental Satellite System. NPOESS will merge civilian and military weather satellites into a single system. Like NOAA-19, NPOESS satellites will orbit Earth from pole to pole, circling the planet roughly every 100 minutes and observing every location at least twice each day. NPOESS will have yet more capabilities drawn from its military heritage. Dim-light sensors will improve observations of the Earth at night, and the satellites will better monitor winds over the ocean — important information for ships at sea and for weather and climate models. “A lot more capability is going to come out of NPOESS, improving upon the 161 various environmental data products we already produce today,” Wrublewski says. Not even a Swiss army knife can do that many things, he points out. For more on the NPOESS, check out http://www.npoess.noaa.gov. Kids can find out about another NOAA satellite capability — tracking endangered migrating species — and play a fun memory game at http://spaceplace.nasa.gov/en/kids/poes_tracking. The Chariot Lunar Truck is one idea for a vehicle equal to the lunar terrain. Each of the six wheels pivot in any direction, and two turrets allow the astronauts to rotate 360 degrees. The flight computer onboard the Lunar Excursion Module, which landed on the Moon during the Apollo program, had a whopping 4 kilobytes of RAM and a 74-kilobyte “hard drive.” In places, the craft's outer skin was as thin as two sheets of aluminum foil. It worked well enough for Apollo. Back then, astronauts needed to stay on the Moon for only a few days at a time. But when NASA once again sends people to the Moon starting around 2020, the plan will be much more ambitious—and the hardware is going to need a major upgrade. “Doing all the things we want to do using systems from Apollo would be very risky and perhaps not even possible,” says Frank Peri, director of NASA's Exploration Technology Development Program. So the program is designing new, more capable hardware and software to meet the demands of NASA's plan to return humans to the moon. Instead of staying for just a few days, astronauts will be living on the Moon's surface for months on end. Protecting astronauts from harsh radiation at the Moon's surface for such a long time will require much better radiation shielding than just a few layers of foil. And rather than relying on food and water brought from Earth and jettisoning urine and other wastes, new life support systems will be needed that can recycle as much water as possible, scrub carbon dioxide from the air without depending on disposable filters, and perhaps grow a steady supply of food—far more than Apollo life-support systems could handle. Next-generation lunar explorers will perform a much wider variety of scientific research, so they'll need vehicles that can carry them farther across the lunar surface. ETDP is building a new lunar rover that outclasses the Apollo-era moon buggy by carrying two astronauts in a pressurized cabin. “This vehicle is like our SUV for the Moon,” Peri says. The Exploration Technology Development Program is also designing robots to help astronauts maintain their lunar outpost and perform science reconnaissance. Making the robots smart enough to take simple verbal orders from the astronauts and carry out their tasks semi-autonomously requires vastly more powerful computer brains than those on Apollo; four kilobytes of RAM just won't cut it. The list goes on: New rockets to carry a larger lunar lander, spacesuits that can cope with abrasive moon dust, techniques for converting lunar soil into building materials or breathable oxygen. NASA's ambitions for the Moon have been upgraded. By tapping into 21st century technology, this program will ensure that astronauts have the tools they need to turn those ambitions into reality. Learn more about the Exploration Technology Development Program at www.nasa.gov/directorates/esmd/aboutesmd/acd/ technology_ dev.html. Kids can build their own Moon habitat at spaceplace.nasa.gov/en/kids/exploration/habitat. Where did all these gadgets come from?! Dawn will be the first spacecraft to establish orbits around two separate target bodies during its mission—thanks to ion propulsion validated by Deep Space 1. Ion propulsion. Artificial intelligence. Hyper-spectral imagers. It sounds like science fiction, but all these technologies are now flying around the solar system on real-life NASA missions. How did they get there? Answer: the New Millennium Program (NMP). NMP is a special NASA program that flight tests wild and far-out technologies. And if they pass the test, they can be used on real space missions. The list of probes that have benefited from technologies incubated by NMP reads like the Who's Who of cutting-edge space exploration: Spirit and Opportunity (the phenomenally successful rovers exploring Mars), the Spitzer Space Telescope, the New Horizons mission to Pluto, the Dawn asteroid-exploration mission, the comet-smashing probe Deep Impact, and others. Some missions were merely enhanced by NMP technologies; others would have been impossible without them. “In order to assess the impact of NMP technologies, NASA has developed a scorecard to keep track of all the places our technologies are being used,” says New Millennium Program manager Christopher Stevens of the Jet Propulsion Laboratory. For example, ion propulsion technology flight-tested on the NMP mission Deep Space 1, launched in October 1998, is now flying aboard the Dawn mission. 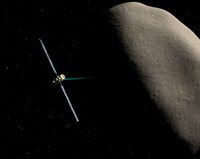 Dawn will be the first probe to orbit an asteroid (Vesta) and then travel to and orbit a dwarf planet (Ceres). The highly efficient ion engine is vital to the success of the 3 billion mile, 8 year journey. The mission could not have been flown using conventional chemical propulsion; launching the enormous amount of fuel required would have broken the project's budget. “Ion propulsion was the only practical way,” says Stevens. In total, 10 technologies tested by Deep Space 1 have been adopted by more than 20 robotic probes. One, the Small Deep Space Transponder, has become the standard system for Earth communications for all deep-space missions. Stevens knew many of these technologies when they were just a glimmer in an engineer's eye. Now they're “all grown up” and flying around the solar system. It's enough to make a program manager proud! The results of all NMP's technology validations are online and the list is impressive: nmp.nasa.gov/TECHNOLOGY/scorecard/scorecard_results.cfm. For kids, the rhyming storybook, Professor Starr's Dream Trip: Or, How a Little Technology Goes a Long Way at spaceplace.nasa.gov/en/kids/nmp/starr gives a scientist's perspective on the technology that makes possible the Dawn mission. On this power-grid map of the United States, the black-circled areas are regions especially vulnerable to collapse during an extreme geomagnetic storm. Inside those boundaries are more than 130 million people. Credit: National Academy of Sciences report on severe space weather. Did you know a solar flare can make your toilet stop working? That's the surprising conclusion of a NASA-funded study by the National Academy of Sciences entitled Severe Space Weather Events—Understanding Societal and Economic Impacts. In the 132-page report, experts detailed what might happen to our modern, high-tech society in the event of a “super solar flare” followed by an extreme geomagnetic storm. They found that almost nothing is immune from space weather—not even the water in your bathroom. The problem begins with the electric power grid. Ground currents induced during an extreme geomagnetic storm can melt the copper windings of huge, multi-ton transformers at the heart of power distribution systems. Because modern power grids are interconnected, a cascade of failures could sweep across the country, rapidly cutting power to tens or even hundreds of millions of people. According to the report, this loss of electricity would have a ripple effect with “water distribution affected within several hours; perishable foods and medications lost in 12-24 hours; loss of heating/air conditioning, sewage disposal, phone service, fuel re-supply and so on." It takes a very strong geomagnetic storm to cause problems on this scale—the type of storm that comes along only every century or so. A point of reference is the “Carrington Event” of August-September 1859, named after British amateur astronomer Richard Carrington who witnessed the instigating solar flare with his unaided eye while he was projecting an image of the Sun on a white screen. Geomagnetic storms triggered by the flare electrified telegraph lines, shocking technicians and setting their telegraph papers on fire; Northern Lights spread as far south as Cuba and Hawaii; auroras over the Rocky Mountains were so bright, the glow woke campers who began preparing breakfast because they thought it was morning! “A contemporary repetition of the Carrington Event would cause … extensive social and economic disruptions,” the report warns. Widespread failures could include telecommunications, GPS navigation, banking and finance, and transportation. The total economic impact in the first year alone could reach $2 trillion (some 20 times greater than the costs of Hurricane Katrina). The report concluded with a call for infrastructure designed to better withstand geomagnetic disturbances and improvements in space weather forecasting. Indeed, no one knows when the next super solar storm will erupt. It could be 100 years away or just 100 days. It’s something to think about … the next time you flush. One of the jobs of the Geostationary Operational Environmental Satellites (GOES) and the Polar-orbiting Operational Environmental Satellites (POES) operated by NOAA is to keep an eye on space weather and provide early warning of solar events that could cause trouble for Earth. You can keep an eye on space weather yourself at the National Weather Service's Space Weather Prediction Center, www.swpc.noaa.gov. And for young people, space weather is explained and illustrated simply and clearly at the SciJinks Weather Laboratory, scijinks.gov/weather/howwhy/spaceweather. The Peony Nebula star is the second-brightest found in the Milky Way Galaxy, after Eta Carina. The Peony star blazes with the light of 3.2 million suns. It sounds like an impossible task: Take a star a hundred times larger in diameter and millions of times more luminous than the Sun and hide it in our own galaxy where the most powerful optical telescopes on Earth cannot find it. But it is not impossible. In fact, there could be dozens to hundreds of such stars hiding in the Milky Way right now. Furiously burning their inner stores of hydrogen, these hidden superstars are like ticking bombs poised to â€˜go supernova' at any moment, possibly unleashing powerful gamma-ray bursts. No wonder astronomers are hunting for them. Earlier this year, they found one. The star lies behind a dense veil of dust near the center of the Milky Way galaxy. Starlight traveling through the dust is attenuated so much that the Peony star, at first glance, looks rather dim and ordinary. Oskinova's team set the record straight using NASA's Spitzer Space Telescope. Clouds of dust can hide a star from visible-light telescopes, but Spitzer is an infrared telescope able to penetrate the dusty gloom. Oskinova believes this is just the tip of the iceberg. Theoretical models of star formation suggest that one Peony-type star is born in our galaxy every 10,000 years. Given that the lifetime of such a star is about one million years, there should be 100 of them in the Milky Way at any given moment. Could that be a hundred deadly gamma-ray bursts waiting to happen? Oskinova is not worried. Nevertheless, the hunt continues. Mapping and studying supermassive stars will help researchers understand the inner workings of extreme star formation and, moreover, identify stars on the brink of supernova. One day, astronomers monitoring a Peony-type star could witness with their own eyes one of the biggest explosions since the Big Bang itself. Now that might be hard to hide. 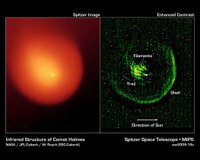 Find out the latest news on discoveries using the Spitzer at www.spitzer.caltech.edu. Kids (of all ages) can read about “Lucy's Planet Hunt” using the Spitzer Space Telescope at spaceplace.nasa.gov/en/kids/spitzer/lucy. What Happened to Comet Holmes? Comet Holmes as imaged by the multiband imaging photometer (MIPS) on the Spitzer Space Telescope. The enhanced contrast image at the right shows the comet's outer shell and mysterious filaments of dust. One year after Comet 17P/Holmes shocked onlookers by exploding in the night sky, researchers are beginning to understand what happened. “We believe that a cavern full of ice, located as much as 100 meters beneath the crust of the comet's nucleus, underwent a change of phase,” says Bill Reach of NASA's Spitzer Science Center at the California Institute of Technology. “Amorphous ice turned into crystalline ice” and, in the transition, released enough heat to cause Holmes to blow its top. Anyone watching the sky in October 2007 will remember how the comet brightened a million-fold to naked-eye visibility. It looked more like a planet than a comet—strangely spherical and utterly lacking a tail. By November 2007, the expanding dust cloud was larger than Jupiter itself, and people were noticing it from brightly-lit cities. Knowing that infrared telescopes are particularly sensitive to the warm glow of comet dust, Reach and colleague Jeremie Vaubaillon, also of Caltech, applied for observing time on the Spitzer Space Telescope—and they got it. “We used Spitzer to observe Comet Holmes in November and again in February and March 2008,” says Reach. The infrared glow of the expanding dust cloud told the investigators how much mass was involved and how fast the material was moving. “The energy of the blast was about 1014 joules and the total mass was of order 1010 kg.” In other words, Holmes exploded like 24 kilotons of TNT and ejected 10 million metric tons of dust and gas into space. Whoever heard of a weather report like that? Get used to it. Weather reports of the future are going to tell you a lot more about the atmosphere than just how warm and rainy it is. In the same way that satellite observations of Earth revolutionized basic weather forecasting in the 1970s and 80s, satellite tracking of air pollution is about to revolutionize the forecasting of air quality. Such forecasts could help people plan around high levels of ground-level ozone — a dangerous lung irritant — just as they now plan around bad storms. “The phrase that people have used is chemical weather forecasting,” says Kevin Bowman of NASA's Jet Propulsion Laboratory. Bowman is a senior member of the technical staff for the Tropospheric Emission Spectrometer, one of four scientific sensors on NASA's Aura satellite. Aura and other NASA satellites track pollution in the same way that astronomers know the chemical composition of stars and distant planetary atmospheres: using spectrometry. By breaking the light from a planet or star into its spectrum of colors, scientists can read off the atmosphere's gases by looking at the “fingerprint” of wavelengths absorbed or emitted by those chemicals. From Earth orbit, pollution-watching satellites use this trick to measure trace gases such as carbon monoxide, nitrogen oxide, and ozone. However, as Bowman explains, “Polar sun-synchronous satellites such as Aura are limited at best to two overpasses per day.” A recent report by the National Research Council recommends putting a pollution-watching satellite into geosynchronous orbit—a special very high-altitude orbit above the equator in which satellites make only one orbit per day, thus seeming to hover over the same spot on the equator below. There, this new satellite, called GEOCAPE (Geostationary Coastal and Air Pollution Events), would give scientists a continuous eye in the sky, allowing them to predict daily pollution levels just as meteorologists predict storms. “NASA is beginning to investigate what it would take to build an instrument like this,” Bowman says. 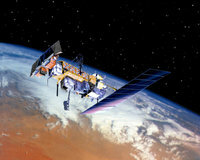 Such a chemical weather satellite could be in orbit as soon as 2013, according to the NRC report. Weather forecasts might never be the same. Learn more about the Tropospheric Emission Spectrometer at tes.jpl.nasa.gov. Kids can learn some elementary smog chemistry while making “Gummy Greenhouse Gases” out of gumdrops at spaceplace.nasa.gov/en/kids/tes/gumdrops. The "Baby Boom" galaxy loosely resembles the galaxy shown here, called Zw II 96, in this Hubble Space Telescope image. This galaxy is only 500 million light-years away, while the Baby Boom galaxy is 12.3 billion light-years away. A star is born. A star is born. A star is born. Repeat that phrase 4000 times and you start to get an idea what life is like in distant galaxy J100054+023436. Astronomers using NASA's Spitzer Space Telescope and ground-based observatories have found that the galaxy gives birth to as many as 4000 stars a year. For comparison, in the same period of time the Milky Way produces only about 10. This makes J100054+023436 an extreme starburst galaxy. Capak is lead author of a paper entitled “Spectroscopic Confirmation of an Extreme Starburst at Redshift 4.547“ detailing the discovery in the July 10th issue of Astrophysical Journal Letters. 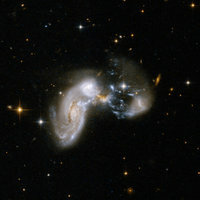 The galaxy appears to be a merger, a “train wreck” of two or more galaxies crashing together. The crash is what produces the baby boom. Clouds of interstellar gas within the two galaxies press against one another and collapse to form stars, dozens to hundreds at a time. This isn't the first time astronomers have witnessed a galaxy producing so many stars. “There are some other extreme starburst galaxies in the local universe,” says Capek. But the Baby Boom galaxy is special because it is not local. It lies about 12.3 billion light years from Earth, which means we are seeing it as it was 12.3 billion years ago. The universe itself is no older than 14 billion years, so this galaxy is just a youngster (Capak likens it to a 6-year-old human) previously thought to be incapable of such rapid-fire star production. Capak and colleagues are busy looking for more Baby Boomers “to see if this is a one-off case or a common occurrence.” The theory of evolution of galaxies hangs in the balance. Meanwhile… A star is born. A star is born. A star is born. 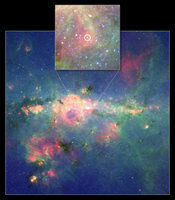 See more breathtaking Spitzer images at www.spitzer.caltech.edu/Media/mediaimages. Kids can play the new Spitzer “Sign Here!” game at spaceplace.nasa.gov/en/kids/spitzer/signs. “Google for satellites” type of web portal will allow users to request real-time data from Earth observing satellites. If you could see every satellite passing overhead each day, it would look like a chaotic meteor shower in slow motion. Hundreds of satellites now swarm over the Earth in a spherical shell of high technology. Many of these satellites gaze at the planet's surface, gathering torrents of scientific data using a dizzying array of advanced sensors — an extraordinary record of our dynamic planet. To help people tap into this resource, NASA researchers such as Daniel Mandl are developing a “Google for satellites,” a web portal that would make requesting data from Earth-observing satellites almost as easy as typing a search into Google. “You just click on it and it takes care of all the details for you across many sensors,” Mandl explains. The vision is to simply enter a location anywhere on Earth into the website's search field along with the desired information types — wildfire maps, vegetation types, floodwater salinity, oil spill extent — and software written by the team goes to work. “Not only will it find the best sensor, but with proper access rights, you could actually trigger a satellite to take an image in the area of interest,” Mandl says. Within hours, the software will send messages to satellites instructing them to gather the needed data, and then download and crunch that raw data to produce easy-to-read maps. For example, during the recent crisis in Myanmar (Burma) caused by Cyclone Nargis, an experimental gathering of data was triggered through Sensor Web 2.0 using a variety of NASA satellites including EO-1. “One thing we might wish to map is the salinity of flood waters in order to help rescue workers plan their relief efforts,” Mandl says. If the floodwater in an area was salty, aid workers would need to bring in bottled water, but if flood water was fresh, water purifiers would suffice. An early and correct decision could save lives. Thus far, Mandl and his team have expanded Sensor Web 2.0 beyond EO-1 to include three other satellites and an unmanned aircraft. He hopes to double the number of satellites in the network every 18 months, eventually weaving the jumble of satellites circling overhead into a web of sensors with unprecedented power to observe and understand our ever-changing planet. 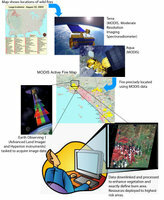 To learn more about the EO-1 sensor web initiatives, go to http://eo1.gsfc.nasa.gov/new/extended/sensorWeb/sensorWeb.html. Kids (and grown-ups) can get an idea of the resolution of EO-1's Hyperion Imager and how it can distinguish among species of trees—from space at http://spaceplace.nasa.gov/en/kids/eo1_1.shtml .